Tristan Hall - Page 3 of 4 - Husband, Father, Techie, Photographer, and Entrepreneur. Let me make a confession, I have been working on a different topic for this episode for a few hours and kept interrupting the preparation thereof with many distractions. So I have decided to change the topic to that of distractions. If you have had a blog or tried to write a book you may have a great deal of experience with the internet black hole. It goes something like recalling that there was this really cool statement you heard on a podcast earlier in the week. You go looking for it to make sure that you quote and attribute it correctly in your blog. The first podcast you check out that you thought the statement was made in proved to be wrong. Then you think it may have been in a Ted Radio Hour podcast about a related topic. You find it is not in that episode either, but you try Google the key word and TED to try to find the video on YouTube. This sends you to a very interesting video on the same subject but not the one you were looking for. You go put the washing on while still listening to the video as it finishes and autoplay starts another video that interests you. Since you skipped a few minutes while doing the washing and the visuals used on the TED stage, you go back to the start of the video. You pause the video to check a WhatsApp message that has just come in. Because the video in the link shared on that group won’t play properly (why do media sites have such bad video players on their own sites. YouTube is still king of the hill by a million miles for adapting quality to bandwidth) you go looking to see if the video in the news article shared on the group is on YouTube and find another video or two that interest along the way. Eventually, you chat yourself two hours later and return back to your blog post beating yourself up for getting to easily distracted. Another common distraction in the workplace is in the stable diet of work communication, Email. You are busy with a task in response to an email when you notice an email has come in from your boss. You open it up and read through it. You decide to respond quickly. As you return back to your task you see a reply back to your reply from you boss again with another task. You judge that it is not as urgent yet as your current task so leave that email open to handle later and again try to resume your current task. You are just getting back into the groove of the task when another email comes through, or a colleague comes to your desk to ask about the email from the boss that you intend to come back to later. The day just continues. There is also the alternative where you are doing a task that is important but not urgent right now yet you think you should try to get ahead of the load so you kick it off. The trouble is that you really dislike the task and so you actively respond to any email that comes in looking for other work to take you away from the work that you are going to regret not getting done sooner when there were fewer demands on your time. Another distraction is the office chit chat. It is amazing how quickly we will pick up on some points of conversations and wish to contribute to the discussion when we feel like we are the only one not a part of the banter and are just focused on our work. They continue to be a necessary evil in the workplace, but it fascinates me how some people can complain about having to attend meetings and then dominate them with issues or raise topics not really on the agenda. Sometimes we can look to meetings as a great time killer to get us to lunch if we can just get them to last 30mins longer. There are many other distractions I am sure, the man issue is what to do about them. The simple method is to work on our self-control but let us be real, that is never going to happen over night. The human mind is perplexing at times. We feel a great sense of accomplishment and get a shot of feel-good when we complete a task but somehow, we easily forget that feeling in the moment a new task approaches us that we particularly dislike. It seems sad but in many ways, the brain easily recalls the negative and unpleasant but requires much more active policing and engagement to replace those recollections with positive experiences such as the feel-good at the end of the completed task. Um, as I was saying about podcast distractions. There is a TED Radio Hour podcast that looks at decisions and how basically people make up stories to help them believe they have actively made a choice when many decisions are pre-decided or even engineered for us. The example given by Dan Ariely in his TED Talk is the changing of a form from opt out or opt in and how many people never read or tick the box. When asked why they decided on their choice, they share some compelling story to justify their supposed decision. How does this apply in distractions you may ask? Just like I know that if I leave cookies on my desk, several people will help themselves before I return from a bathroom break, we can review what things easily distract us and rather than leave the temptation there (like the cookies on the desk) actively look for ways to remove these distractions. For example, there are applications to lock down your browser for certain periods of time or you can close down Outlook for 30mins while you just focus on a task. Put your phone on silent with it only set to ring maybe if your wife calls. Don’t just focus on the negative though, reward yourself for a solid period of focused effort even if the task is not yet completely done. You may also find techniques like the Pomodoro Technique helps you get focused and more effective at completing a task. In the end, you want to try to avoid getting to the end of the day and feeling like you accomplished little because you were so easily distracted. Such a distracted routine wil not help your confidence in the long run. Welcome to this weeks Tech Talk Tuesday where we will look at some tech tales that caught my eye online and a personal experience with Facebook Fraud, but first, Elon Musk is worried about the Artificial Intelligence Apocolypse. Recode is reporting that Elon Musk – the South African born, real life equivalent of Tony Stark or Iron Man – spoke at the National Governors Association Summer Meeting in Rhode Island USA, labelling AI as the “biggest risk we face as a civilisation”. He is calling on the government to regulate artificial intelligence proactively warning that it is too late then “people see robots going down the street killing people”. I recently watched the 2004 movie ‘I, Robot’ starring Will Smith. If you have seen the film, you will realise that it illustrates the fear Elon has been warning about since 2014. Is it possible that the programme to Mars is a plan B not just to escape Global Warming? About a month ago, I engaged in a sale of a product through a closed group on Facebook which I think could be beneficial for some of you. Let me start that my “spider senses” if you will, went off early on in my experience, nevertheless I had an amount I was prepared to risk and see if I was right. Because of the closed nature of the group on Facebook, I had assumed that people might be more trustworthy. I saw a product that had been listed for a while and thought it might be that the seller would be more negotiable. The initial advert was not badly priced, but the condition in the photos looked like I would be justified in seeking a lower sales price. It turned out that the selling – through messenger – came out with a price a little under half. At this point, I became a little concerned. I decided to engage the process further though and if proven right in my suspicion, I might warn others on the group. I sent a little money ahead to cover overnight shipping and the much reduced asking price. After 24 hours of having a tracking number that did not pull up any results, I contacted the courier company. It turned out the waybill number give was being phased out and the store from where the parcel was supposedly being sent, was already using the newer sequence waybill. I started digging into the profile of the person and also found a profile by the same name with one or two common friends. I started to suspect that the account was cloned from that person as the real person’s account had posts in the timeline while the suspected clone did not. Also the account I suspected to be a clone had posts in our groups for selling items. Some of these ads were too good to be true in terms of pricing. While this was happening I was still engaging the person and when they realised I was on to them, they blocked me from their profile. This meant I could not report their profile or see their ads. All I had was the chat history with them. Last week I noticed the profile picture of the account had changed. I then asked a friend in the same group to check if the person was posting because I had been blocked from seeing their profile. My friend could see a repost of the same product and ran a Google Image search of the photos posted. It was a match for a forum by a person in the USA from a few years ago. The fraudster was just using images stolen from the web. When my friend asked for extra pictures the fraudster was on the run again. So some key takeaway points. Ask for as many details and extra pictures of a product as you can. Do a Google Image search for the images in the ad. Trust your gut or ‘spider-senses’ if it just doesn’t seem right. Lastly today, I wanted to share this video from the TWiT network about smartphone addiction. It is very enlightening with Psychotherapist Georgia Dow from iMore joining the discussion on the topic. This podcast seldom records on weekends but reports from Daily Maverick on Saturday that Jacob Zuma has been offered amnesty and Two Billion Rand if he steps down before he completes his term, I had to get a friend on and chat about it. 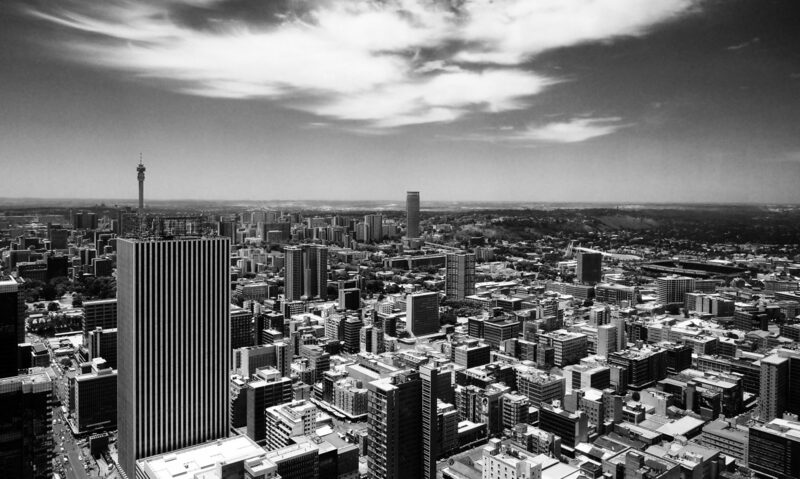 So in this episode, Darryl Gibbs and I talk about this report and what our, average South African, non-political views are. Darryl also shares his experiences from being in Brazil and we see similarities (if any) can be drawn from their experiences with political scandals. This is the second segment of Throw Back Thursday. I have a feeling this segment may not have the same appeal as some of my others though. If you don’t find this segment interesting, please let me know. If you do, then share some of your Throw Back moments in the comments of this show in my blog or by calling into the podcast using the Anchor app. Today I thought I would talk about the first SLR camera I ever owned, a used Canon A-1 which I purchased in my teens from what was then called Fripps Rosebank, the store is known (since 1998) as Kameraz, still located in Rosebank Johannesburg. Between some savings and selling my birthday present, a desktop PC, (a big deal back then for a kid to own), I got enough money together to purchase a used SLR camera. I had found out about Fripps (Kameraz) through my Gran who had happened upon the store while living in the area. To me, it was like being in Willy Wonka’s chocolate factory. Cameras that graced the ads in National Geographic, lined the window display. Richard (who still works in the store on my last visit there) helped me out and sold me a Canon A-1 with auto-winder, 50mm lens, and a teleconverter. It was not in mint condition, but it got me started. It was a rough learning curve given the many electronics and lack of a camera manual for several weeks, I almost gave up on photography after the first two rolls or so of film that came back from the lab. I changed the camera before the first year was complete I believe, hooked on a notion that a different camera would help me take better pictures. It took many years and a lot of pricey camera changes to accept the truth of what others told me, that it was not the cameras fault. Today I regret selling many of the cameras I have owned, but I likely regret the trading of that Canon A-1 the most now. It took me a long time to realize the place this camera held in history. 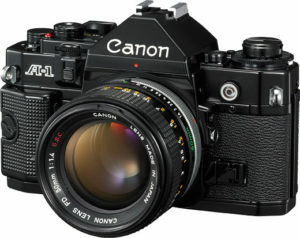 Canon revealed the A1 to the world in 1978 and ran till 1985. It launched long before digital and even before Autofocus in a camera. In fact, the Canon A-1, the top end model of the A-series of cameras, was the first camera to offer a fully electronically controlled, autoexposure mode. Basically the P-mode on just about every D/SLR that followed this camera came trace it roots back to this machine. It was also the first camera to the best of my knowledge, to have a fully digital exposure readout in the viewfinder. Rather than a needle that you had to get balanced in the center of a kind of scale window, this Canon A-1 had red LED in the style of a calculator display that gave you the camera’s aperture and shutter speed values. It really was a strong competitor in a world that often seemed extremely Nikon dominated. I still find myself itching to own one again. Who knows, maybe I will. I was going to chat about lessons I learned from a movie I recently saw, but in chatting with my wife this evening, I came to a realization that there was a much more relevant topic to speak on this evening from a personal perspective. It is actually alarming how often then, that companies take this for granted. The most important relationship in many ways is the customer. The goodwill built with an existing customer makes increases the chance of repeat business in a massive way. Trying to win new customers or get clients to return after a bad experience is extremely costly and difficult. The relationship with the customer is built by sales teams and after sales teams. It is also established and maintained by your actual product to the consumer. There is a saying that “you are only as good as your last sale”. Think on that. I am in an environment where that often seems to be the case. From a consumer perspective, I have had a great experience with customer sales and service recently. My family, due unforeseen circumstances, have had to return back home to South Africa while I continue to work in Nigeria. Since we had sold our car back home before we moved to Nigeria for my current employment, it became necessary to purchase a used car again. With the help of my dad, we found a good clean car that was still in our budget. The car is a little Kia which seem to be extremely resilient given what I have seen of them here in Nigeria, but the dealership is a Honda dealership about 30km from where my family currently live. I was a little worried about what the experience would be like, after all, I am buying this car from Nigeria with only my dad seeing. The salesman, a great guy by the name of Sam, has continued over the past few months, to go above and beyond with this car. It has had an ongoing niggle with the electric windows and on a few occasions has gone back to them while waiting for parts to come to resolve the problems. Each time, they send a loan car, drive it out to the family 30km away and pick up our car and do it all over again. Again, for the price we paid for this car, I really did not expect this service. I have yet to meet Sam in person, but I know that between him and this Honda dealership, I will certainly get my upgraded car from them. I am sold on them and not the car we got, and it was not even the brand they regularly deal in. I have gotten a little sidetracked. The point of the discussion I had with my wife is that your personal network and the quality of those relationships is extremely important in your work life, be that as an entrepreneur or an employee. The owner of that business spoke highly of me to the owner of my favourite camera store in Johannesburg which got me a part-time position working there. That workplace connected me to many industry people which helped me in both the companies I co-founded in the future. After serving a two-year, volunteer service mission for my church, I applied to a few jobs. I got one with a startup company as a salesman and later the sale manager. That is to date at least, the only job that did not have some link to someone I know or was part of my network. This is a critical point, and I think many people will find the same is true for them, that their best chances for change and/or success come through people they know. Business is about people and the relationships you keep with them. Lastly, there are some relationships that I would hope we never take for granted in the search for our business relationships and that is family. Those who have worked away from their family for periods of time I think will mostly agree, it can be extremely lonely. That said, I see people all the time who may as well be away from their families they immerse themselves so much in their work and networking. There is always a cost to every choice we make. Try to better understand those costs and make the more right choices more often. Welcome to another Tech Talk Tuesday segment of the podcast. For those that are in the USA, I believe it is happy Amazon Prime Day too. Despite residing outside of the USA, I decided to browse some of the deals. Here are some items you may want to check out. So some of the functionality on Amazon’s Echo and Echo Dot is still limited outside of the USA (for example, you have to ask for the weather of the city your reside in by name as geolocation for asking what the temperature is “outside” won’t work and the answer will still be in Fahrenheit) but it is still a cool gadget that also keeps little kids amused for a while. The Acer Chromebook 15 is not thin and light, but it offers great specs (for a Chromebook) at a great price, even when it is not on sale. It sports a 15-inch Full HD screen, Intel Celeron processor, 4GB of RAM and a 16GB SSD. Keep in mind this is a Chromebook so most of your work will be stored in Google Drive. This is a great machine for home use without sacrificing a quality screen. This device just appealed to me because when you have a family there are always multiple phones and tablets needing to be charged and taking turns on half as many chargers as devices. This desktop charger can power seven devices at once with a stand that resembles the organisation of a filing cabinet drawer. Check out the Okra 7-Port Hub USB Desktop Universal Charging Station (what a name) and see for yourself. As reported on The Verge, Ubuntu is now available in the Windows Store. This flavour of Linux will run in a sandbox alongside Windows 10 which will allow it to access shared files and hardware with your Windows 10 installation. You will need to navigate to your Control Panel in Windows and select a setting in the “Turn Windows Features On or Off” menu called “Windows Subsystem for Linux”. To be honest, I cannot say I geeking out too much about this, but are there some of you out there that find this really exciting? What am I missing by not playing with Linux? So with this podcast being in its second week, I have been looking at all the places you can listen to your favourite audio feasts. Just over the weekend, this humble show has gone from being published with Anchor.FM and in iTunes, to now also being available on PocketCast, Stitcher, TuneIn and – sadly not working in Africa but confirmed by my family in the USA – Google Play podcasts as well. For those who maybe do not know what all of these services are, let me break down a few of them briefly. Anchor is an audio service that runs best out of their apps for Android or Apple’s iOS. It is like radio for the modern age, even more so than traditional podcasting I think. I say this because, in one app, creators of content can record their own voice, interviews, insert music and even receive and share call-ins to their show. It is simple to create your own station and easy to listen to other people’s stations. It used to be that segments you recorded were only available for 24hrs but a recent update introduced the option to select your segments before the 24hrs window is up and push them into a single episode that is broadcast as a podcast (hosted by Anchor) and syndicated to iTune and Google etc for you. Without this app, this podcast would never have got off the ground. Both of these services are similar to my mind at least. Before I got PocketCast as my go-to app for listening to my favourite podcasts on Android, I used to use Stitcher. I also tried TuneIn as bit as well. Both services offer you thousands of live radio stations from around the world as well as various podcasts and archived radio shows in case you missed them when they were broadcasting live. So as you can see, there is no shortage of places to listen to this and many other podcasts out there. I am interested to know which services you use to listen to audio on your smartphone, tablet or laptop? Maybe you even listen on your Amazon Echo! Either way, let me know by calling in on the Anchor app or drop a comment in the blog post for this episode. To avoid last minute planning, I am working on some of my podcast content in advance. While I am preparing I am listening to one of my favourite podcasts, TED Radio Hour from NPR. The particular episode I was finishing is Disruptive Leadership. It tied in well with the thought I wanted to share on my Mostly Me Monday feature, namely Supportive Parents. It is an idea that extended from my podcast on Friday and where I experience a “kick to the head” type moment as I mentioned how supportive my parents were of my photography endeavours. The more I reflected on it, the more it burned. I have realised how cruel the ignorance and self-centeredness of youth can be later in life. Only now as I reflect on it, the hours I spent arguing with my parents (over several years) about camera gear etc, just how ungrateful it appeared I was of the support they had already shown to that point in time. As I look back on my relatively short life so far, I can see how so much of who I am today and what I have achieved goes back to my parents and their support. That said, the long nights of arguing, have also taught me the skills that I use in my work life now. I am not sure my Dad would be impressed with hearing that, but it is true. I recall planning my case and preparing my facts to support my arguments before they began. These skills continue to help me with engaging business people both internally and externally in my own businesses or being in corporate employ when decisions need to be swayed. Parents are continually moulding their children’s characters be it in active engagement or the passive examples of their own life conduct. Getting up early on a day off to take you to a practice game, or the long hours of repeating school through helping you with homework. Not everyone may be able to have the opportunity to be raised in such a way or to raise children of their own, but the question we should still ask ourselves, is what kind of leader are we unknowingly being to others? As an extension of my reflections, I am looking at how I can be more supportive as a father today and in the years to come. I am fortunate to still have my Dad as a living example. Let me close off by asking you to share, how have you been influenced by parents and leaders in your life?